The photo on the left, taken this week at the Surfside Jetty where my son, Lewis, and I began a day of birding, shows the female great-tailed grackle that was pestering my son, Lewis, for a bite of his breakfast taco. Her male comrade was a bit more standoffish. 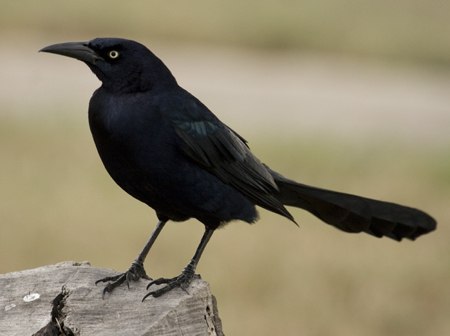 Great-tailed grackles are one of the birds that make every birder’s list if they live anywhere in Texas. The smaller common grackle is a bit more choosy about where it lives in the state, and the third North American grackle, the boat-tailed, even choosier. It can only be found along the shores of Texas’ Gulf Coast, and then mostly only on the more northern end. Florida is the boat-tail’s favorite habitat. On this day of chasing down birds, the great-tailed grackle was the only one of the three species Lewis and I saw, although on most bird outings in the area we get the common, too, and occasionally even a boat-tailed grackle. Male great-tailed grackle. Note the bright yellow eye. It’s easy to tell the common and the great-tailed apart simply by size. The common is a 12-inch bird and the great-tailed a 15-18-inch bird, the male being the larger of the sexes. The boat-tailed, meanwhile, is close in size to the great-tailed but with a very round head. compared to a very-flat head for the great-tailed. You can also easily tell the two apart if the boat-tailed is vocal – and it usually is. 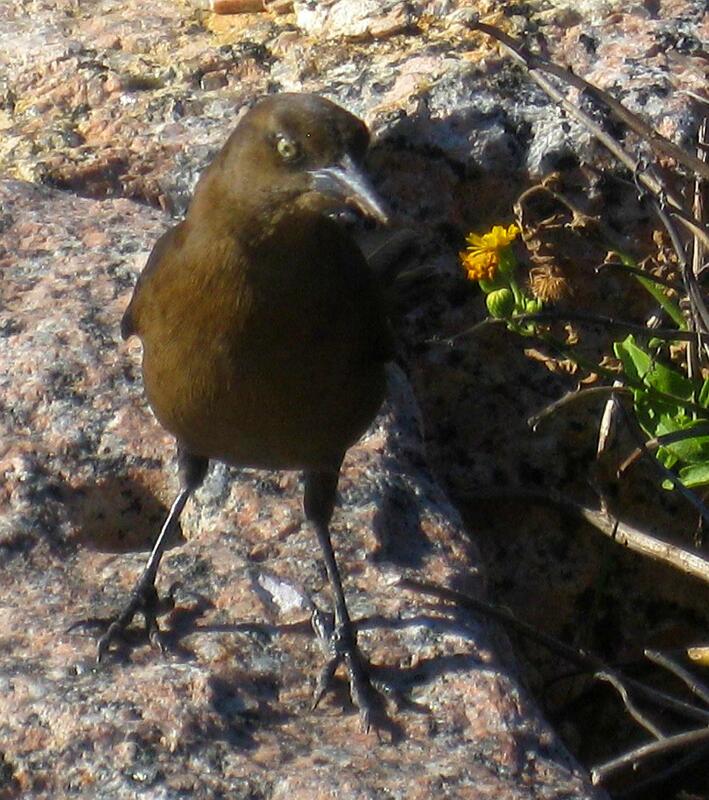 Its voice is more coarse and gravelly than those of the other two grackles. . The females of all three species are varying shades of brown. Grackles, which often roam about in large flocks, are considered nuisance birds by some. And while that might not be far off the mark, since they prefer harvesting a farmer’s crops more than living off uncultivated land, I still enjoying watching them. Perhaps it’s because I admire their attitude, such as the one displayed by the female this day that wasn’t going to be intimidated out of any Taco droppings by we mere humans. Or perhaps it’s because I find the iridescent purple and green sheen on the males’ feathers a work of art. Or perhaps it’s simply because all birds fascinate me. We get grackles here in the winter. I think they are probably the great-tailed because they are the larger bird. I didn’t realize there were so many varieties. I like the purple & green sheen too. I finished “The Big Year”; then had to get out my bird book and look up the some of the birds they were talking about. I see more birds in the winter so will pay attention and see what I can come up with. Try to photograph them, but they just won’t stay still for me. One day I chase 2 pilated woodpeckers around the palm trees in the front yard for 10 minutes trying to get a picture of them before they flew off. Another talent I will have to put on my “to do” list. Ever so often a huge flock will descend onto our property. I love the noise they make and how they can easily cover a tree in black. Grackles used to eat overripe berries from a ligustrum by my parents’ driveway and then stagger around the yard. That would have been a fun sight to have seen. It was. Except we had to keep hosing off the sidewalk. I love the Grackles. I don’t see enough of them, but when a flock comes through, it’s just pure joy here. Thanks for sharing.